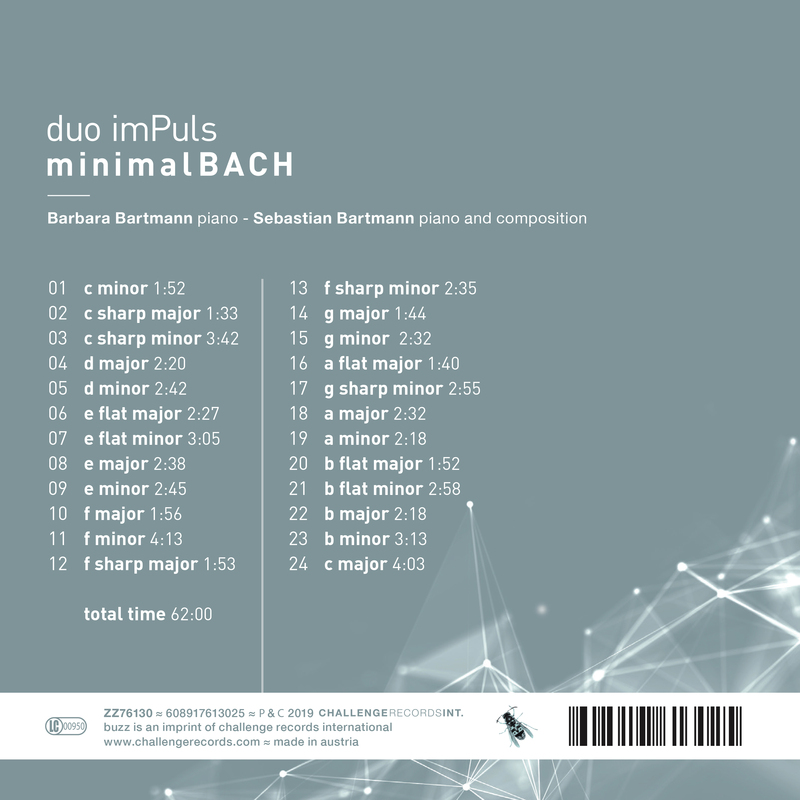 Barbara and Sebastian Bartmann have performed together as duo imPuls for thirteen years, playing both music for four hands on one piano and on two pianos. They have appeared in various European concert halls, such as in Berlin (Konzerthaus), Lisbon (Gulben- kian), Brussels (Palais des Beaux-Arts), Ljubljana (Cankar Hall), and Cracow (Philharmonic), as well as at festivals, including the Ludwigsburg Palace Festival, the Stuttgart Music Festival, the Oberstdorf Music Festival, the Mecklenburg-Vorpommern Festival, and the Edvard Grieg Festival in Oslo. They made their debut at the Merkin Concert Hall in New York City in October 2010. The duo has also won numerous international competitions. It achieved a historic success at the Dranoff Competition in Miami in 2013, where it received all the best performance prizes, the Bronze Award, and the audience prize. In August 2009 it won first prize at the International Contemporary Chamber Music Competition in Cracow, appearing as the Flügelschlag Quartet together with percussion colleagues Ákos Nagy and Claudius Heinzelmann. The previous year duo imPuls won first prize at the Valberg Competition in Nice, the first time the prize was awarded, and at the Edvard Grieg Competition in Oslo in 2007, where, in addition to first prize, it also received the Grieg Prize and the special award for contemporary music. Both musicians are scholarship winners of the Richard Wagner Society and the Yehudi Menuhin Foundation Live music now!. In addition to classical and romantic literature, their repertoire also includes works by Sebastian Bartmann, who composes in a wide range of styles within the areas of experimental improvisation, sound installation, film and stage music, and media projects. His compositions have been performed in a number of European countries and the US and have received several awards: IBLA Foundation (Sicily/New York), the Composition Award of the City of Düsseldorf (IDO Festival). The duo has drawn artistic inspiration from its work with the Stenzl Piano Duo, the Tal- Groethuysen Duo, and Genova & Dimitrov as well as André Marchand, Konrad Elser, Michael Seewann, Mauricio Kagel and Sian Edwards. duo imPuls has appeared in various radio and television productions with ZDF, SWR, WDR, ARTE and Deutschlandfunk as well as foreign broadcasting companies. 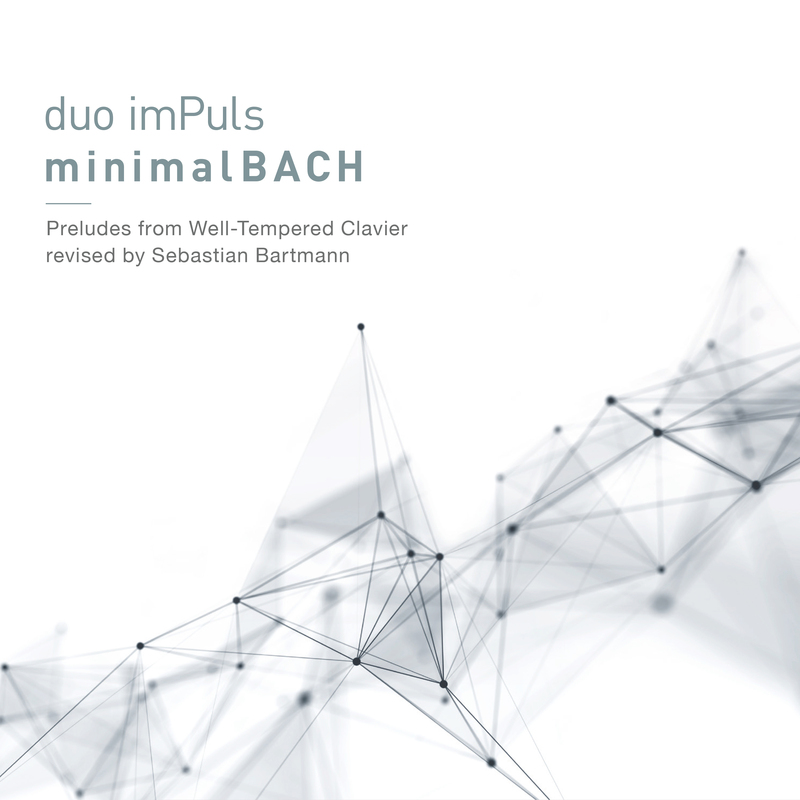 The new project “minimalBACH” by piano duo “duo imPuls” is dedicated to the Preludes by Johann Sebastian Bach from the first volume of the Well-Tempered Clavier, which are placed in the new, exciting listening context of minimal music”. The aim of composer and pianist Sebastian Bartmann is to use “minimalBACH” to focus on the musical essence and effects of the individual Preludes by J.S. Bach, to extract their radiance and to shed new light on them with the techniques of minimal music. Das neue Projekt „minimalBACH“ des Klavierduos „duo imPuls“ widmet sich ganz einer Auswahl von Präludien von Johann Sebastian Bach aus den beiden Bänden des „Wohltemperierten Klavier“, die in den neuen, aufregenden Hörkontext der „minimal music“ gestellt werden. In Bachs Präludien lassen sich unzählige minimalistische Strukturen finden, nicht zuletzt die charakteristischste Kompositionstechnik der sog. „Fortspinnung“ von kleinen musikalischen Ideen und Motiven zu einem kunstvollen Gewebe. Die „minimal music“ – mit den Hauptvertretern Steve Reich, Philipp Glass und Terry Riley – brachte eine bis dahin unbekannte radikale Einfachheit hervor, indem auf ein motivisches Fortspinnen in der Art wie es bei Bach geschehen ist, verzichtet wurde, stattdessen an Motiven und Patterns über lange Strecken nur kleinste Veränderungen vorgenommen wurden. Durch die heutigen Einflüsse der digitalen Gestaltungsmöglichkeiten (Ton & Film) sind Techniken wie Zeitlupe, Loops, harte Schnitte, Überblendungen, Farbkorrekturen in das allgemeine Verständnis von Bild und Tonsprache gerückt. Der Anspruch des Komponisten und Pianisten Sebastian Bartmann ist es, mit dem „minimalBACH“-Projekt die musikalische Essenz und die Affekte der einzelnen Präludien von J.S. Bach ins Visier zu nehmen, deren Strahlkraft zu extrahieren und mit den Techniken der „minimal music“ sowie den genannten modernen Techniken neu zu beleuchten. 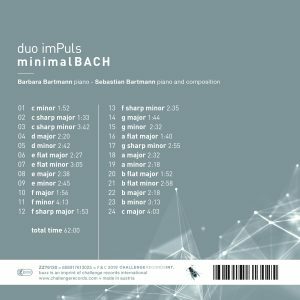 minimalBACH, das neue Projekt des Klavierduos duo imPuls, ist den Präludien aus Johann Sebastian Bachs erstem Buch des Wohltemperierten Klaviers gewidmet und hier in neues, aufregendes Hörumfeld der Minimal Music versetzt. Komponist und Pianist Sebastian Bartmann möchte das Projekt minimalBACH nutzen, um sich auf die musikalische Essenz und die Effekte der individuellen Präludien zu konzentrieren, ihren Glanz hervorzuheben und mit den Methoden der Minimal Music neue Facetten zu beleuchten. 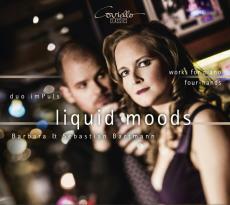 Piano duo imPuls presents on their CD ‘Liquid moods‘ several works which demonstrate that the music played in a dimly lit bar lounge often displays unexpected qualities and is much more than soft background music. The program became a somewhat eccentric journey in time through the bars of Havana, Paris, and New York and, at the same time, an homage to the bar as a place where stories are not only told but melancholy and lightheartedness also meet.